We've represented over 500 clients in Orange County and have sold over $500,000,000. Take a look at some of our recently sold homes. Our Team works tirelessly until your home is sold. Neighbor to the Ritz Carlton and newly built Montage, you're at home with a standard of living consistent with the world's finest resorts. Whether in its days as a private retreat for A-list celebrities or as a home to its discerning designer, Hale Ali'i has always been a generous host. Perfectly situated amid the lush, rolling hills overlooking historic San Juan Capistrano, 27112 Highland Drive is a lavish, sprawling estate that artfully blends resplendent European grandeur with spacious California tranquility. 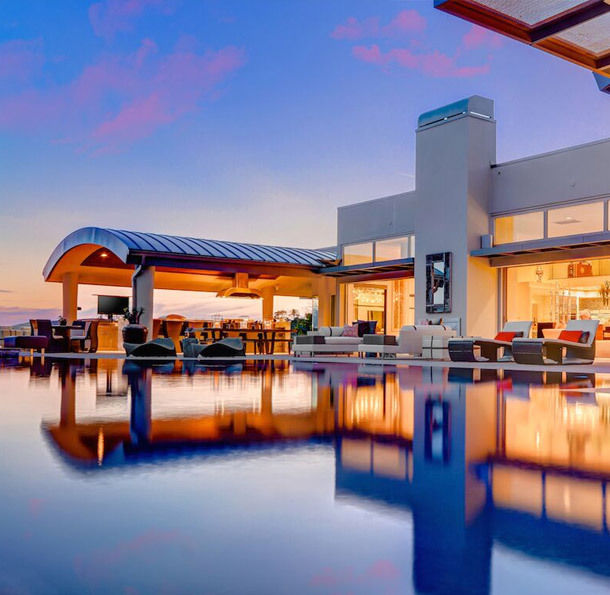 Forty miles from Downtown Los Angeles, twenty-five miles from Orange County's best beaches, and minutes from the esteemed Nixon Library and award-winning Black Gold Golf Course, a modern hillside estate rests perched atop Yorba Linda's most prestigious neighborhood. You're looking for luxury & privacy. Welcome. Iron French doors greet you. First level offers a spacious bedroom with an en suite, den, and a private bedroom with its own kitchenette, a home office adorned with dark wood and bookshelves that climb the ceilings. Impress your guests with the exotic fish inhabiting the saltwater tank as you enter the formal living room. Panoramic ocean views throughout. Schedule a consultation - we'd love to meet you and help you get the process started.